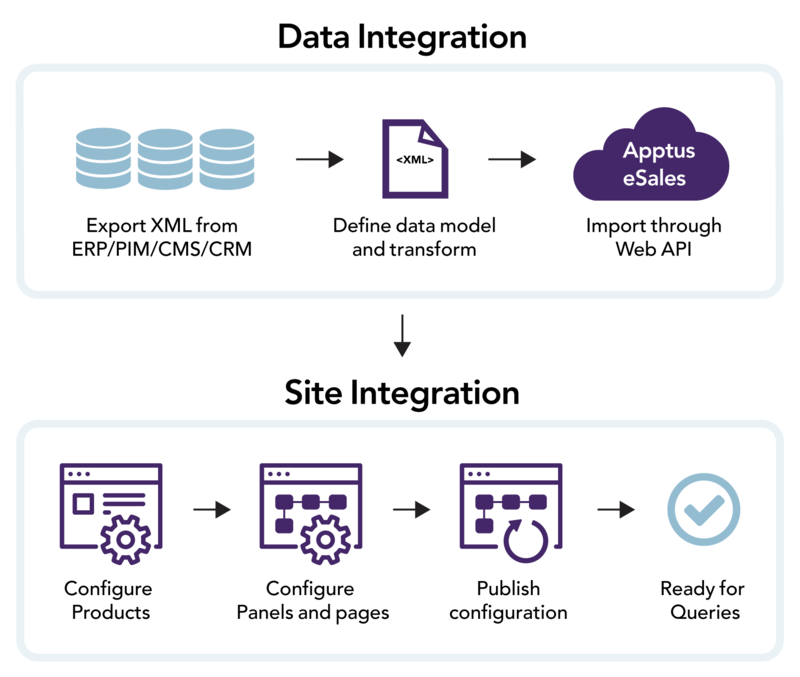 The goal of the Apptus eSales Integration Overview is to provide insights into the concepts, steps, and decisions required for a successful integration with Apptus eSales to a retailer's e-commerce web site. The integration process is divided into two main parts – Data Integration and Site Integration. The following terms and phrases are necessary to know to fully understand the Apptus eSales Integration Overview. Product The main data entity in Apptus eSales with information about a retailer's product. Products can be imported into eSales via the Web API. Products can have variants and be a part of one or several categories. Variant A data entity that shares many properties with a product but differ with a few. Variants are usually the items that are displayed to the customer. Cluster A group of one or more Apptus eSales servers. Panel A configurable area, or block, on a website that accepts queries and presents results. Apptus eSales include predefined panels functionality for ads, customer actions, navigation, product information, recommendations, and search. Attribute Meta data of a product, variant, ad, or category describing properties. Attributes are used for actions such as search, filter, sort, and more. Retailer A company with an e-commerce website. Merchandiser Person with access to the Apptus eSales apps on behalf of the retailer. A merchandiser will use the Apptus eSales apps to work with promotions, exposure strategies, and more. Visitor A new or returning customer of the retailer's e-commerce website. Apptus eSales can identify visitors across different browsers and units to enable personalisation across devices. User A person with access to the Apptus eSales apps on behalf of the retailer. Administrator A person with administrator access for the Apptus eSales apps on behalf of a retailer. An administrator can manage settings for users and markets with the Apptus eSales apps. Integration partner A development company working together with the Retailer in integrating Apptus eSales. PIM/ERP Product Information Management / Enterprise Resource Planning. The retailer's systems that Apptus eSales communicates with and product data and more is derived from. Query A request from the client made to Apptus eSales that returns a result to, for example, a panel. Apptus eSales is a cloud service that provides automated and contextual displays of products and content based on machine learning for an e-commerce site. It also includes web apps for system configuration and performance reviews. Visitor behaviour data is collected and analysed in the Apptus cloud. This data is used to present results based on the queries sent to the Apptus eSales Web API. The queries can be for search results, recommendations, autocomplete suggestions, and other data needed by a retailer's site. In short, Apptus eSales is a combined search engine, recommendation engine, and content selector for retailers. The Apptus eSales integration process consists of two main parts – Data Integration and Site Integration. These parts will be presented in this overview followed by an introduction to the Apptus eSales Apps and additional information. The first part, Data Integration, covers the key concepts of the product data model, how to set it up, and how these actions are the base for the result data in Apptus eSales. It also covers what must be considered when formulating and developing a data import schedule. Once the parts required for a Data Integration are completed and set up, a Site Integration may commence. The second part, Site Integration, covers the concepts of what is required to have content visible on the retailer's site, and how to have Apptus eSales send and return data to it. This includes configuration of the imported data and how to get the correct results from Apptus eSales behaviour analysis. Apptus eSales Apps is where the day-to-day work will be for users once the Data and Site Integration is completed. The different apps and what they do will be presented. The parts are presented in a chronological order as the retailer's business strategies and decisions regarding items such as products and markets will affect the data model and set up. This will in turn affect the rest of the integration process and workflow.